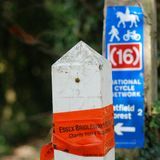 EBA also has regular contact with Hatfield Forest Riders Association and Epping Forest Riders Association. It seems incredible that Essex Bridleways Association has been around for 40 years. Looking at how our county has changed during that time, it makes me think that EBA founder and president, Deirdre Graham, and her fellow equestrians, were ahead of their time. In reality though, they were fighting for the same causes as today’s bridleways groups: claiming lost or mismarked Rights of Way and creating and preserving safe off-road access where riders could escape motorised traffic. 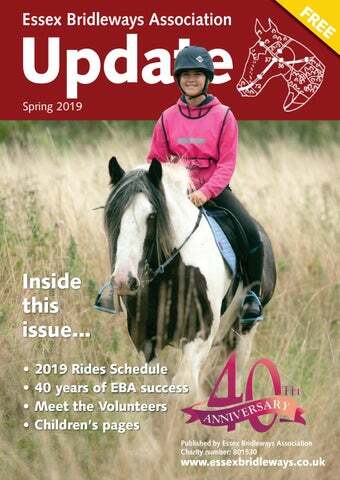 If there was such a need 40 years ago, then goodness knows Essex horse owners certainly need EBA now, so please, spread the word and get involved in helping protect access rights for future generations. from the fantastic Julie Pryer; a hard act to follow. I certainly wouldn’t still be here now without the support of the other Trustees. It’s real team work and that team stretches to all our Area Reps and regular volunteers past and present. I love the job, though it can be a rollercoaster of emotions. I have made lifelong friends and met so many interesting and dedicated people along the way. To mark our birthday we are planning a special Ruby Ride in September. Katie JerramHunnable, our patron, is kindly hosting the ride at her farm in Aythorpe Roding so look out for that. Also, I would like you all to save the date of our AGM this year (14th November) as we are planning a party to celebrate our birthday and we want you all to come along to make it a night to remember, so get it in your diary now! I hope you enjoy reading the Update. We have put together a collection of memories depicting the hard work and achievements, past and present, which make EBA the remarkable organisation it is today. involved a few laughs along the way - particularly with regard to the participants demonstrating the Heimlich manoeuvre! Membership on the rise We are delighted to report that EBA currently has more than 700 members: the highest figure in the group’s 40 year history. Numbers are incredibly important when it comes to EBA’s work, so can you help to make our numbers swell even further by recruiting your friends and family? Membership is only £15 a year for adults and free for under 16s. See page 23 for full details and benefits. his year marks EBA‘s Ruby Anniversary and we are in the mood to celebrate, with so much achieved in that time, thanks to the foresight of our founder and president, Deirdre Graham (interview on pages 811) and our volunteers, past and present. So much has changed in the past 40 years, and continues to do so, making the work of Essex Bridleways Association all the more important if we are to secure safe, off-road routes for future generations of horse riders. EBA is constantly working with ECC’s PRoW team The changing face of EBA and planning department, looking at possibilities for new and improved routes, especially those linking bridleways, or those which help create circular routes: for example, Thorndon Country Park, where the North and South Parks are now linked. Nags Head Lane link and Boyles Court to Dark Lane in the Brentwood area have proved invaluable, and also the completion of improvements to the Flitch Way, a linear route following the former Bishops Stortford to Braintree Railway Line, which now extends to 16.4 miles. In addition, we are fast approaching the 2026 deadline, whereby any “lost” routes that are not already on the Definitive Map will be gone forever. Never, in all of its 40 years, has EBA’s work - and your membership and support - been more important. EBA VOLUNTEER OF THE YEAR EBA’s press secretary, Mary Balch, was announced as Michael Clark Volunteer of the Year at November's AGM - much to her surprise. The Committee unanimously selected Mary in recognition of the work she has carried out for the charity. Having become involved with EBA in its infancy, she has taken on a number of roles, including writing our regular column for Essex Rider magazine. Find out more about this worthy recipient of the award on page 15. Clay Lane Clearance Thanks go to Lesley Gillman, Sarah Hodgson and Tim Kirby, who kindly spent a couple of hours clearing a stretch of bridleway at Clay Lane, Little Dunmow, for the benefit of all users. 6 Amazon Smile smile.amazon.co.uk Just switch to shopping through Amazon’s alternative website called Amazon Smile - it is exactly the same and run by Amazon. The only difference is that EBA will receive a 0.5% donation from Amazon. It takes less than two minutes to switch, so please do it today and EBA can start receiving free money for all your purchases. Expedia, Amazon, eBay, all the major supermarkets, holiday operators, insurance providers, plus a wide range of smaller and more niche online shops and stores. The amount donated to your chosen cause varies but will be anything from 0.5% to 10%. There are lots of promotions available too, which donate more for a limited period, or if you introduce a friend, or on certain products. Give As You Live www.giveasyoulive.com This works in the same way as easyfundraising you register and select EBA as your chosen charity. Then shop via the Give As You Live website with all the big name retailers (they have over 4,100 stores available) and raise between 1% and 10% for EBA on your purchases. ore than fifty people braved the chilly November night for our AGM and were rewarded with a hugely informative talk by Julie Springett, Fire & Rescue Fire Prevention Officer and BHS Herts Chair. Simon Taylor from ECC PRoW team kindly joined us again this year to answer questions, alongside EBA researchers, Chris Tout and Sue Dobson, and Malcolm Lees of the Open Spaces Society. This annual event is a great time to catch up with everyone and it was particularly good to see Mick Brash, who has done an enormous amount to support EBA during its 40 years and has an extraordinary depth of knowledge when it comes to RoW matters. AGM Raffle Special thanks to Baileys Horse Feeds, Ingatestone Saddlery, Jumpers Horse Line, Likit Products, Mark Todd Collection, Equisafety and Brentwood D-Livery, who donated prizes for the EBA raffle which raised an impressive ÂŁ215. Stud Muffins also gave a pack of their treats to everyone who joined us on the night. EBA Founder, Deirdre It was a pleasure and a privilege to spend time recently with Deirdre Graham, one of the founders of EBA and our current president. I visited Deirdre at the historic home she has lived in for some 60 years. Her friend, Jenny Mann - EBA Rep for Thurrock - also joined us for tea and a chat. I was able to explain to Deirdre some of our recent successes and initiatives, and also to advise her that we now have over 700 members. She was delighted to hear that EBA continues to go from strength to strength from its small beginnings. eirdre is now 96 years old but retains her passion and zeal for EBA. The vision of safe offroad riding for the horse owners and riders of Essex remains very close to her heart. Deirdre has had the most fascinating and in her words â&#x20AC;&#x153;an amazing and happy life.â&#x20AC;? She kindly agreed to answer some questions about her life and the history of EBA. Did you grow up in Essex and were you always involved with horses? No, I was born in Morocco. I arrived in the world as Mother made her way on the long journey from England to Borneo to join my father who was working in the tin mining industry there. One can only imagine how arduous that trip must have been, with two small children and then the County Hall 2001 - Dierdre Graham left. Trust, whose husband Peter was Member of Parliament for Saffron Walden area, was also key in the early days and was able to promote the cause at national level. With working horses being such an integral part of English farming and transport history, how did so many bridleways and byways become lost and was there a catalyst that prompted the group to take action? wings on his feet because he was back so quickly with a photograph of about five dead animals/birds strung up on a cord between two posts – an old method used to scare wildlife away. The farmer never forgave me. The scheme cost Thurrock Council more than £350,000. It’s the route EBA have used for a ride. We wanted to get it right to the coast but the Council simply did not have the money and I think it has been built upon now. What was your own personal favourite place to ride? I don’t ride anymore but I always loved riding through Langdon Hills Country Park. Details Lovely grassy tracks (with some optional jumps) and just a few quiet, remote roads. Includes 3 mile shorter route. The route will depend on ground conditions but we will try to use some of the softer tracks. Back by popular demand. A lovely ride starting out from this superb venue. A chance to ride in this wonderful, ancient forest on wide grassy clearings and tracks between the trees. A 3 mile gentle group lead rein ride, all within the forest. A new ride for us, exploring the bridleways around Ramsden Heath and South Hanningfield. 12 miles of tracks, bridleways and some minor roads with a shorter option available. Also includes the optional cross country course at Riffhams. A special ride to celebrate EBAâ&#x20AC;&#x2122;s 40th Anniversary, hosted by our Patron, Katie Jerram-Hunnable. A varied route which takes in the wide grassy tracks of Howletts Hall and Fingrith Hall. Oh so many canters. This is our Members-only Christmas ride, mainly on surfaced tracks around the park with festive fancy dress, mulled wine and mince pies. Come and join us for the evening to find out more about EBA's work and to celebrate our 40th Anniversary A long way off but something for EBA members to look forward to. change has been the ability for us to fund researchers. The extra income from running more rides has enabled us to pay for three part-time people. Chris Tout to do the historical research on lost ways, Sue Dobson to liaise with the “powers that be” to ensure that horse riders are not forgotten in planning issues, and Mary Pengelly to manage various projects for us and seek funding. The committee all work very hard but having these people with the time to dedicate to our work has made an amazing difference. well catered for. So often I think - oh yes Katy did that for us. Mick Brash is another longstanding helper who, although he no longer comes to our meetings, still keeps his eye out for us and has a wealth of knowledge. And of course there are many, many more Area Reps and Committee members (past and present) who have contributed so much. We do have John Heginbotham to thank for the more professional style of the Update which Carol Allison has carried on for us. Q: Why do you do it? A: The honest answer is, I don't know why, but something inside just drives me. I do enjoy finding new places to ride and then showing others. Maybe thatâ&#x20AC;&#x2122;s it? Taking people to the beach who have never ridden on a beach before is always very rewarding as this is often helping them make their dreams come true. Our committee is very friendly, we have a laugh and we are all good friends. Why not join us? also used to marshal our rides regularly once the great pairing of Lesley Gillman and Katy Haines started to create loads of fundraising rides for EBA members and friends. Liz Hollingsworth EBA Epping Forest Area Rep. I joined the EBA in 2011 to take part in that year’s Hatfield Forest ride. I’d had Cara for a year and, having started her myself, I needed to get her out and about - as we all know the EBA rides are perfect for beginners (horses and people). I went on to do the Thorndon Park ride that year but at the time I didn’t have my own transport and Cara wasn’t too good at loading. Volunteer opportunities... more competent than me within the Association. I’ve also helped EBA researchers who need to call on local knowledge to save their time and deal with issues more efficiently. The EBA does a fantastic job in promoting horse riding in Essex and a lot of work happens unseen that improves hacking in the county. The picture is of Cara and me at last year’s Highwood ride. We both love this ride because we can canter for ages around the lovely grassy headlands. Colchester Area Rep We are looking for someone to take on the role of EBA Area Rep and become our point of contact in the Colchester area. No previous experience is necessary and you will have the full support of the EBA team, with training given where required. You could even share the post with a friend. certainly increased my knowledge of the area, boosted my self confidence as a rider and have given me enormous fun with my horses. However these rides, and our membership, also fund important work, researching and lobbying for change and improvements in our bridleways in Essex and generating a voice for horse riders in the area so that politicians, planners and local authorities listen. EBA has achieved an awful lot through the energy and commitment of volunteers working together and riding together. It’s a real force for good and I am delighted to have found it and to be part of it. A few brave souls ventured into the deep, dark forest for our spooktacular Halloween Lead Rein Ride last October, but luckily everyone came out smiling and pleasantly surprised. Ride organiser Denise Dillon had been out early in the morning, attaching ghosts, bats and spiders to the trees so that the children could look out for them, but without frightening the ponies. Everyone had made a huge effort with their Halloween costumes and they all looked fabulous. One pony even had a gold spider sprayed onto her shoulder. We were blessed with a beautiful sunny day and the children really enjoyed their trek round Epping Forest. It was a pleasure for them to ride somewhere a bit different in a safe environment and the route was even kind to the adults walking with the ponies, as it was fairly flat. We had hoped that a weekday in half-term would attract a good number of riders but sadly this was not the case. However, those who did come had a great time and it was worth all the effort just to see their smiling faces when they got back. Check the rides schedule on pages 12 and 13 for details of this yearâ&#x20AC;&#x2122;s EBA lead rein rides. An inaugural meeting of the Essex Bridleways Association was held on Monday, 26th November 1979 at the Day Centre in Billericay. EBA Christmas Ride These brilliant fancy dress costumes at our annual Christmas Ride certainly raised a smile. Well done to Jane Thornton riding Boxer (pigs in blankets with brussel sprouts) and Ruth Gedalovitch on Hansel (turkey and carrots) for putting in so much effort – right down to the hand-crocheted carrots and sprouts. EBA is working hard to create and protect off-road access for future generations to enjoy - why not get in touch to find out how you can help us make a difference. Rights of Way Panel at Stoneleigh. During this period riding rights are being lost. Roads are cutting riding routes, farmers are obstructing and ploughing up bridleways, and the County Council is closing areas like Norsey Woods and Langdon Hills. We urgently need a strong persistent and vocal body of riders to support each other by riding existing bridleways, clearing overgrown ones, familiarising themselves with the laws affecting them, and watching local papers for Public Notices regarding rights of way. No one person can do it in any area. write to Alison Craigmile, EBA Membership Secretary, 40 The Chase, Romford, Essex RM1 4BE. Save our resources: Choosing to renew your membership automatically via PayPal or by standing order cuts administration and reduces EBA print and postage costs. EBA needs your support to fight for safe off-road access for horse riders. Membership costs just £15 a year and is free for under 16s. by cutting down on administration and saves EBA money. • Up to £5 off EBA rides entry fees. • Priority entry to some EBA events, including EBA holidays. • EBA Update magazine delivered to your door twice a year. • Email notifications of news and events. • Access to EBA’s Ride & Share Scheme. • Help with bridleways issues and claims. • Up to 10% on new insurance policies from South Essex Insurance Brokers. • 10% discount from John Griffin Trailer Training. • 30% discount on your first BHS membership - join by phone or paper application, state that you are an EBA member and give your membership number to receive your discount. This action cannot be done via online applications.